Narrative Therapy is a form of conversational therapy based on the proposition that we all tell stories about our lives and experiences, even if only to ourselves, and that it is through the telling of these stories that we make meaning out of our experiences. Often when people go to see a counsellor, their experiences of life are dominated by problem stories (for example: stories of ‘failure’, self-blame, a deficiency in something etc). Narrative therapists look for exceptions to problem-dominated stories because these exceptions are entry points into alternative stories (for example: stories of survival, of resilience, resistance, coping or managing etc). Although we sometimes find ourselves reducing our experience down to a few words (eg ‘I’m a failure at relationships’), other stories can and do exist. Therapeutic conversations can assist us to discover alternative ways of understanding our lives and recover lost or forgotten experiences of ourselves. A narrative therapist has learned and honed particular technical skills that can be used to investigate a range of problems, so these kinds of counselling conversations can even be quite enjoyable! Narrative Therapy is an approach to psychotherapy that was largely developed by Michael White from Australia and David Epston from New Zealand but is now practiced all over the world including London. It offers a way to work with people around their own experience rather than treating them as the objects of expert judgement. Narrative Therapy takes us outside of purely ‘scientific’ or biological ways of thinking about ourselves and our actions. Narrative Therapy looks instead towards our intentions, values, commitments, principles and ‘hopes and dreams’. It also helps us recognise and resist the normative judgements (comparisons, for example) that are so strong in modern western society. Narrative approaches can be used online through Skype text, webcam and email counselling as well as in traditional ‘face to face’ sessions with a therapist. Because Narrative Therapy does not locate problems within people, it is particularly helpful as an approach for anyone who may be under the influence of shame or guilt. Narrative Therapy can help free people from such difficulties by externalising problems and assisting us to develop influence over the problem. 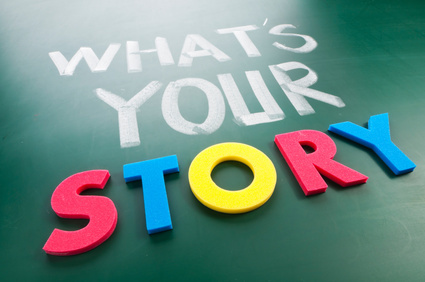 If you would like to know more about Narrative Therapy, or you have some specific questions to ask, please contact me. If you would like to find out more about Narrative Therapy and therapy that uses dialogue and conversation, here are some recommended books. 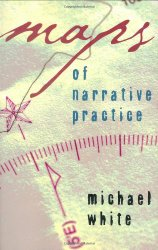 Michael White is regarded as one of the founders of Narrative Therapy. This book provides the clearest outline of his thoughts and practice on the approach. Primarily written for therapists and students of narrative therapy, Maps provides an ideal starting point for understanding narrative approaches from White’s perspective. Harlene Anderson offers an alternative to the culture of psychotherapy that is based on therapist as expert. Her philosophy of therapy is about being in conversation and collaboration with clients. 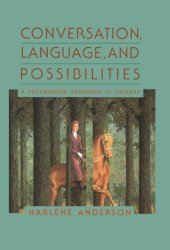 Language generates our lives and relationships and Anderson’s book shows that practices of dialogue can create new possibilities.